The Eastern European city of Prague is outstandingly beautiful and picturesque. Like the rest of Eastern Europe, there is culture, history, and tradition scattered throughout every corner in Prague. Travel to Eastern Europe with Gil Travel on our and see some of the most spectacular sites in the Eastern Europe. 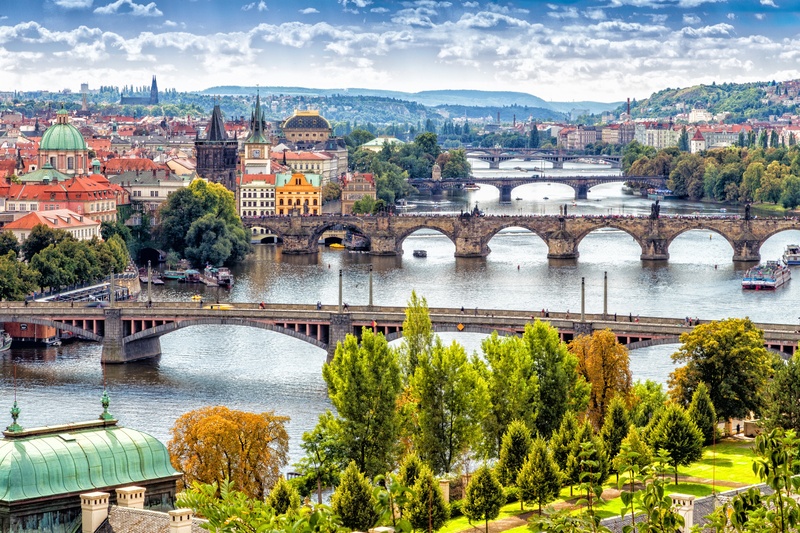 Our tour of Prague includes visits to the Old Town Square, the famous Astronomical Clock, the Jewish Quarter, St. Nicholas Church, Charles Bridge; as well as a tour of the Royal Castle of Hradcany, the St. Vitus Cathedral, and more. The best time to go to Prague is in the spring or fall. Although the snow-capped spires of Prague are beautiful to see, the winter in Prague can be very cold and many of the tourist attractions have shortened hours. During the summer, the days are longer and warmer—which makes it a popular this time of the year to visit. However, this means lines to tourist attractions are longer. Summer rains are also fairly common in Prague. Spring is a perfect time to visit Prague, because there are not that many tourists and the temperature stays mild. Fall is also a great time to visit because the weather is fairly mild and all of the leaves are changing colors, making Prague look like a town from a fairytale. Czech cuisine is fairly meat heavy. Beef and pork are the main proteins in Prague. They are typically served in a sauce with a starch; usually either dumplings, potatoes, or rice. Wash it down with a pint of beer or Becherovka, a bitter-sweet, herbal Czech liqueur. Make sure to go see a traditional folklore performance to get a taste of Czech culture and tradition. Also make sure to visit the largest inhabited fortress in the world, Royal Castle of Hradcany. The St. Vitus Cathedral is located within the castle grounds and is also a site that you should make sure not to miss. It is the largest church in Prague took almost six centuries to build. Want to take a tour of Eastern Europe? Prague should absolutely be on your list. Stephanie Lees works Gil Travel in their Social Marketing department. She loves traveling, pottery, and nachos. Please ask whatever questions you have about her experiences or about traveling in general. Her email address is Stephaniel@giltravel.com.